A simple publicity statement in the Stars & Stripes was a harbinger for the century of success that would follow: “The American Expeditionary Force as a whole – doughboy, colonel and general working together – organized the American Legion this month as its postwar association,” said the article that graced the front page of the legendary newspaper’s March 28, 1919, edition. 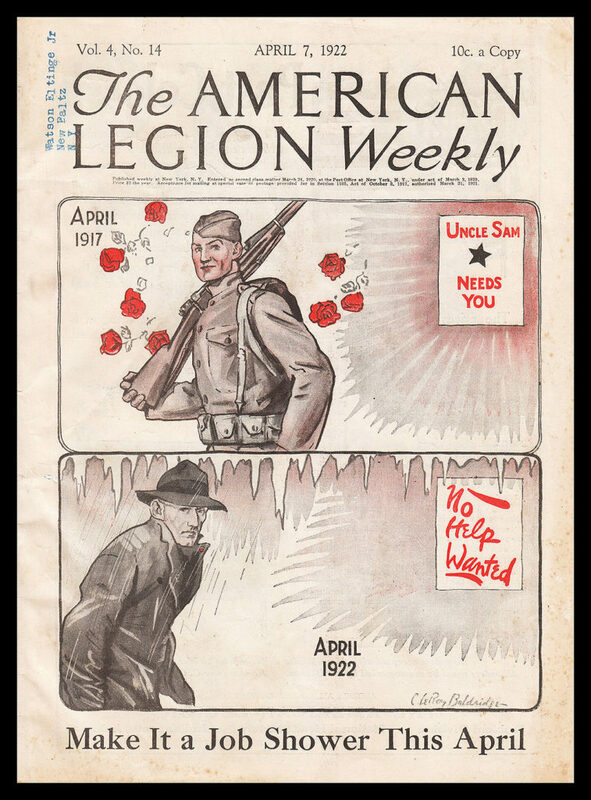 This cover of the first official publication of the American Legion emphasizes the unemployment problem facing many ex-soldiers during the postwar recession. Public domain. An amazing string of accomplishments would follow during the next century. Equally amazing was how quickly the organization took root as a powerful national and community force. Serving fellow veterans is just one of the many ways in which the American Legion assists in communities throughout the land. It has wielded considerable influence in Washington, D.C., since its founding, when there was not yet a Veterans Bureau, Veterans Administration and certainly not a Department of Veterans Affairs. The American Legion believed from the beginning that veterans earned quality health care from a grateful nation. A nation that sends its military to war has a special obligation to make its heroes whole upon their return. After decades of American Legion efforts, a cabinet-level position was created to serve those who served us: the Secretary of Veterans Affairs. Today the American Legion is the greatest supporter of the Department of Veterans Affairs, but when it falls short, the American Legion is also its biggest critic. 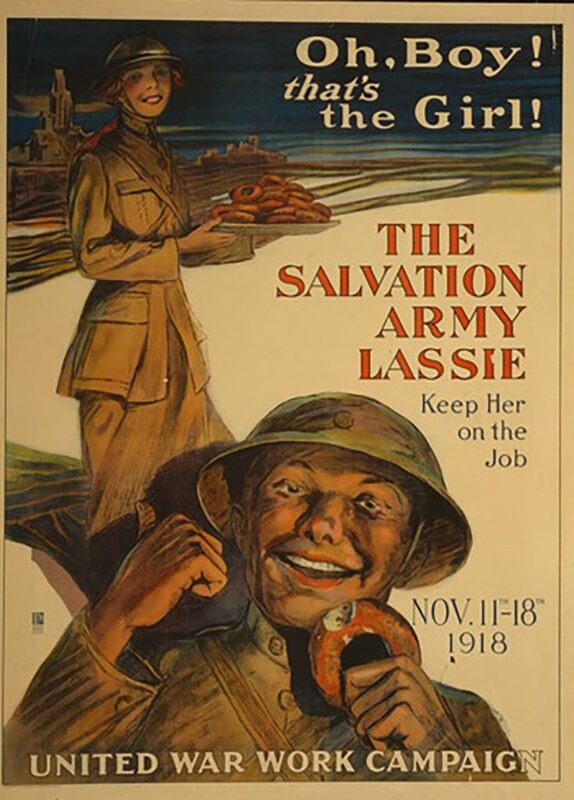 The Salvation Army’s “Donut Lassies” were famous for the fried treats they served to soldiers. Library of Congress image. The author of America’s greatest legislation, past National Legion Commander Harry Colmery, knew that it was right for America to remember returning WWII veterans by making it possible for them to obtain college educations and loans to purchase homes. Although others scoffed that such a benefit would “break the treasury,” the American Legion held firm and ensured the passage of the Servicemen’s Readjustment Act of 1944, also known as the GI Bill of Rights. As the years passed, the GI Bill diminished in value. Once again, the American Legion fought hard for a new GI Bill that would allow veterans of the post-9/11 generation to transfer their benefits to family members. The benefit increased even further when the new “Forever GI Bill” was passed and usage deadlines were eliminated. It was officially named the Harry W. Colmery Veterans Educational Assistance Act of 2017. The organization feels a special obligation to the children of those who died or were severely disabled while on active duty since 9/11. Military parents can take comfort in knowing that the American Legion’s Legacy Scholarship Fund will help pay for their children’s college educations if tragedy should occur while they serve. Another founding pillar of the American Legion is Americanism. As the lead organization responsible for the U.S. Flag Code, Legionnaires can often be found teaching flag etiquette in classrooms across the country. Along with the proper folding and display of the flag, Legionnaires understand the importance of respecting Old Glory. The American Legion serves the youth of America with outstanding programs such as American Legion Baseball, Junior Shooting Sports, Boys State and Boys Nation. The American Legion has supported the Boy Scouts of America since 1919 and today charters 2,400 Scouting units comprising more than 61,000 young men and women. A more recent member of the American Legion family (which comprises the Legion, Legion Auxiliary and Sons of the American Legion) is the American Legion Riders: Legionnaires who ride their motorcycles in parades, provide military funeral escorts, conduct fundraising rides or just go for rides on a beautiful day with their fellow veterans. Although historians have questioned the true source of the classic quote “America is great because America is good,” there is no doubt that America’s goodness is on display at nearly 13,000 American Legion posts throughout the world. Door County has four American Legion posts – Post 402 on Washington Island, Post 527 in Sister Bay, Post 72 in Sturgeon Bay and Post 372 in Forestville. Sturgeon Bay Post 72 participates in county veterans’ programs, sponsors Badger Boys from Sturgeon Bay and Sevastopol High Schools, distributes poppies and conducts fundraisers to aid veterans and their families in our county and state, supports community events, provides military funeral honors, provides Blue Star Banners to families with a service member on active duty and holds social events. We would love to have veterans who are motorcyclists join Post 72 to begin a local chapter of the Wisconsin Legion Riders. Like many veterans’ groups, we are losing the long-term participants at our posts: the WWII veterans. We invite the Korean, Vietnam War and post-9/11 War on Terrorism veterans to visit the nearest Legion post and look into becoming members. The American Legion provides many services and benefits to veterans, along with camaraderie. Sturgeon Bay Post 72 meets on the second Tuesday of the month, February through December. Meetings start at 7 pm at the Knights of Columbus Hall, 692 Tacoma Beach Road in Sturgeon Bay. Some may view the 1919 Stars and Stripes article as Legion prophecy. In other ways, it was an understatement of what the world’s largest and most influential veterans’ organization would become. Legionnaires continue to serve today, with a vision for tomorrow. For further information, such as qualifying dates for membership or area post contacts, call Post 72 Commander Deb Logerquist at 920.823.2109 or visit wilegion.org. 1. Combine all ingredients (except for lard) to make dough. 3. Drop the rings into the lard, making sure the fat is hot enough to brown the donuts gradually. Turn the donuts slowly several times. 4. 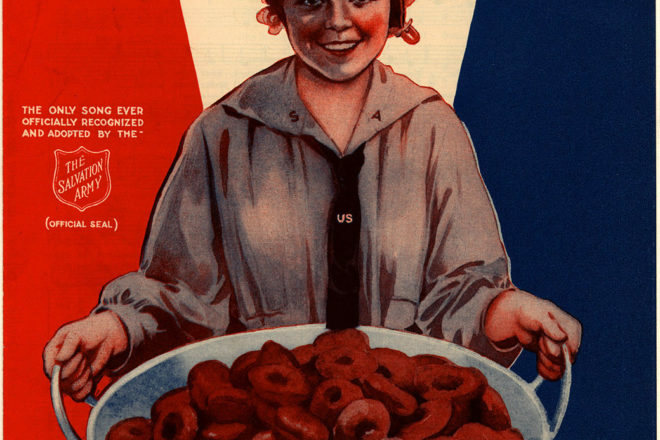 When browned, remove donuts and allow excess fat to drip off. 5. Dust with powdered sugar. Let cool and enjoy. The American Legion is turning 100, and Sturgeon Bay Post 72 is celebrating the milestone on March 12, 5:30 pm, at the Knights of Columbus Hall, 692 Tacoma Beach Road in Sturgeon Bay. The birthday celebration will include a meal of sloppy joes, salads and cake, plus a presentation called “The Doughnut Girls Story” by Tom Mulinix of the Salvation Army. All veterans, spouses and guests are welcome to attend. Call 920.823.2109 by March 9 to sign up. Are We Doing Enough For Wisconsin Veterans?